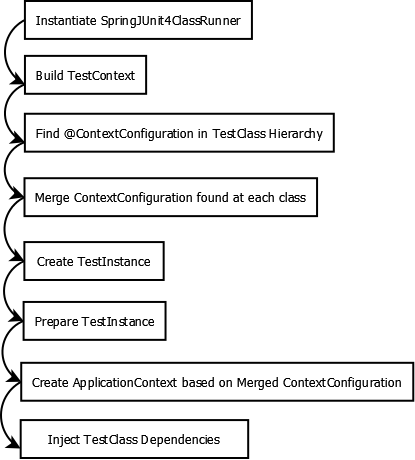 In this article, we will see how spring merges context configuration details declared on a test class and all of its super classes via annotation @ContextConfiguration. We will create a test class hierarchy where each class in the hierarchy declares @ContextConfiguration. BaseContextConfiguration will be the base class which FirstContextConfiguration will extends which in turn will be extended by the test class SecondContextConfiguration. Spring will look for @ContextConfiguration for the given test class and for all the super classes up in the hierarchy. Any spring based test class must run with SpringJUnit4ClassRunner which is responsible to build the test context. As SpringJUnit4ClassRunner is instantiated it build a merged context configuration based on the annotations @ContextConfiguration and @ContextHierarchy. If we have declared @ContextConfiguration in any of the test classes’s super class then spring will merge the context configuration details. When it is ready to prepare the test instance, it will use the merged context configuration to build the ApplicationContext and then it will inject any dependencies declared as its members using @Autowired annotation. Below is the test class which has @ContextConfiguration and it extends FirstContextConfiguration which in turn contains @ContextConfiguration annotation. We have auto-wired Config, Config1 and Config2 members. As you can see test class provides only Config2 in classes attribute of @ContextConfiguration. We will provide the other configuration classes in @ContextConfiguration annotation declared by its super-classes. In verifyBeans(), we make sure spring has successfully auto-wired the dependencies. Here are the other classes in the hierarchy. Here is the base class. The configuration classes are very simple. This was an example of spring merging @ContextConfiguration and using it to build application context.